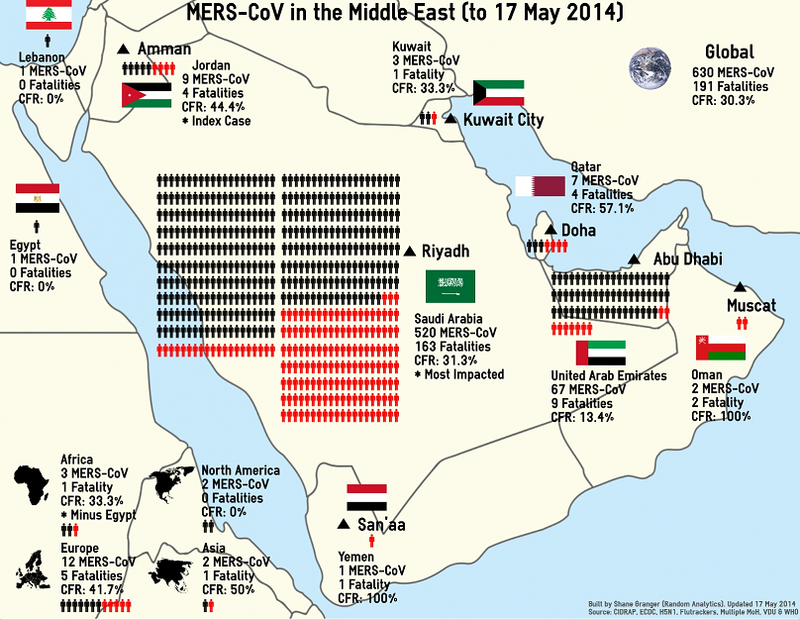 The above infographic is a look into the MERS-CoV with specific emphasis on its cases within the Middle East. The data is taken primarily from the latest ECDC update (see appended) plus the most recent update from the Saudi Arabian MoH (care of Al Jazeera). Since I last updated this infographic back in November 2013 the cases have exploded, especially in Saudi Arabia and the United Arab Emirates. New Middle East countries have also been added since November including Egypt, Lebanon and Yemen. Since April 2012 and as of 16 May 2014, 621 cases of MERS-CoV infection have been reported globally, including 188 deaths. On 11 May 2014 a second imported case of MERS-CoV was confirmed by the United States’ Centers for Disease Control and Prevention. On 13 May 2014, National Institute for Public Health and the Environment (RIVM) in the Netherlands reported the first imported case of MERS-CoV in the country. On 15 May 2014 a second case, who travelled with the first case, was reported. Most cases have either occurred in the Middle East or have direct links to a primary case infected in the Middle East. Local secondary transmission following importation was reported from the United Kingdom, France, and Tunisia.